Over the years in Marion, crimes of passion have occurred that catch the attention of the town for a few days only to quickly fade into obscurity. Often the circumstances of these events are only kept alive in the lore of the families involved, passed down from generation to generation. This is one of those stories. Amy Jo Phillips contacted me back in April of 2015 with a story that immediately piqued my interest. Her great-grandfather had killed a man in the 1920s in Marion’s west end, gone peacefully with the police afterwards and later plead guilty to first degree murder at a preliminary hearing. However, he never actually spent a single day in state prison for it. I met up with Amy Jo in October of 2015 at the Marion Public Library where she gave me the dates I needed to bring up the relevant Marion Star articles on microfilm. More importantly, I wanted to meet her so that she could fill me in on some of the more personal details concerning this story that didn’t necessarily appear in the newspaper. On the morning of August 20, 1926, Denny Large and his wife Ida were having a discussion in their upstairs bedroom at their house on Bartram Avenue when they heard a car pull up outside. It was Charles Edwards, a boarder who, until very recently, had been living with them. He had come to collect some of his belongings and let himself into the Large house. Coming down the stairs, Denny and Ida saw Edwards sitting on the living room sofa. Ida went to sit with Edwards while Denny slipped out the back door and crossed a field to his brother’s house where he retrieved a revolver. Returning to the house where Ida was still sitting with Edwards, Denny shot Edwards twice, killing him almost instantly. Neighbors who heard the gunshots called police, and when they arrived a few minutes later, they found Denny waiting outside and arrested him without incident. That same day, Marion County Prosecutor Frank Wiedeman announced that Denny would be charged with first degree murder. Denny Large was an unlikely killer. 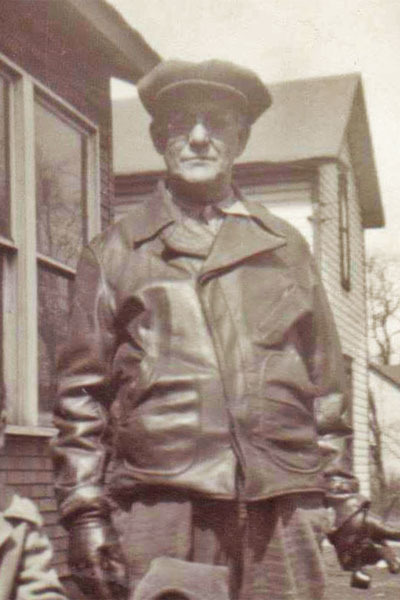 He was the father to six children, including a 15-month-old baby, had been married to the same woman for sixteen years and had been employed at the Marion Steam Shovel Company for six years. So the obvious question was why did Denny Large kill Charles Edwards? It was, of course, the oldest motivation: Ida had been having an affair with Edwards while he was boarding at the Large residence. What’s more, Ida revealed to Denny that Edwards, not Denny, was actually the father of June, their 15-month-old daughter. On the day of his arrest, Denny made a full confession to police. The next day, he entered a plea of guilty to first degree murder before Mayor Earl Hazen and was ordered held without bond at the Marion County Jail until a grand jury could be convened. Under the so-called unwritten law, a man who found out that his wife was unfaithful was free to kill his wife’s lover; the deceived husband was almost never punished for this crime. No statue book actually contained this “law”; but it was reflected in the behavior or prosecutors and certainly in the behavior of juries. Denny Large on Lee Street in the the 1950s. Photo courtesy of Amy Jo Phillips. Put simply, at the time it was widely accepted that a man was within his rights to shoot his wife’s lover, and no Marion County jury was ever going to find Denny Large guilty of murder. Prosecutor Wiedeman’s unwillingness to pursue charges against Denny Large seems to support this. After his release from the Marion County Jail, Denny Large, perhaps uncomfortable with his newfound notoriety, left Marion for Kentucky and worked there for a time. According to Amy Jo, he was conscientious about sending sending Ida and the kids (who remained in Marion) money while he was gone, and he eventually returned to Marion and a job at the Osgood Company. Ida and Denny apparently resolved any differences they may have still had and stayed together for the rest of their lives. They even had another child together in 1931. Denny passed away in 1963 and Ida, who became very religious in her later years, died in 1989. She never remarried. Although Baby June was, at least officially, a Large, Amy Jo said that she grew up knowing that Charles Edwards was her biological father and that she eventually left Ohio and settled in California. I played with a Bud Large as a child off Silver St. I wonder if that was family to Denny….. Very distant. I believe Bud was a 6th cousin of mine. Like his grandfather and mine were cousins. Growing up Bud and I would still tell everyone we were cousins. He lived in the same road as I did. He is 1 year my elder. Hi Amy Jo. Denny Large is my great grandpa. Edgar is my grandpa and Edgar Jr. is my biological father. Wow, what a story. I never got to meet my great grandpa, but I do remember my great grandma. I’m finding more and more about my biological side all the time. Very interesting. Just wanted to introduce myself.